After a third place in 2014 and a second place (after Tom Boonen) last year, Arnaud Démare has now succeeded in winning a thrilling Brussels Cycling Classic. The Frenchman from team FDJ beat Marko Kump (UAE Abu Dhabi) and André Greipel (Lotto-Soudal) in the sprint on avenue Houba de Strooperlaan. On a sun-drenched morning at Jubelpark/Parc du Cinquantenaire, the public could catch a glimpse of the packed throng of participants. A large number of household names made their appearance on the starting podium and it quickly became clear that most teams were putting forward a sprinter to go all out for race victory. Quick-Step went for Marcel Kittel, Lotto-Soudal for André Greipel and FDJ for Arnaud Démare. 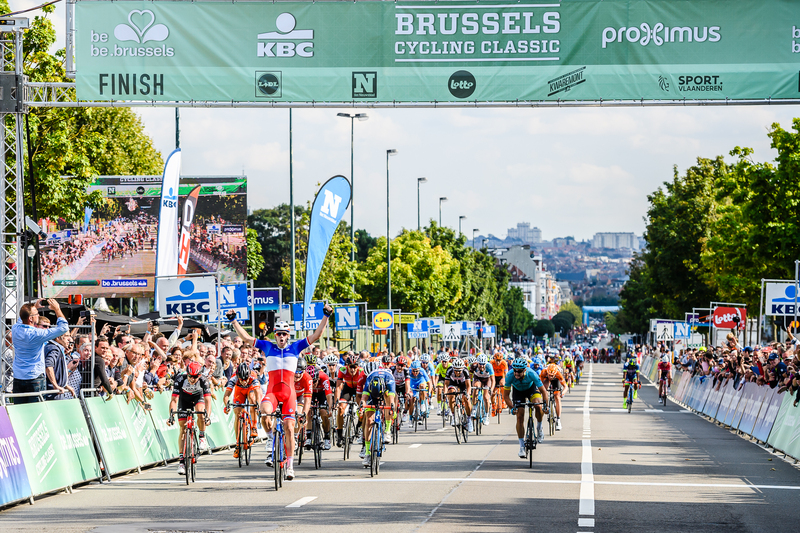 With Bennett (Bora-Hansgrohe), Cocquard (Direct Energy), Bouhanni (Cofidis), Stuyven and Degenkolb (both Trek-Segafredo), many outsiders also had their eyes on a win in this 97th Brussels Cycling Classic. After just 9 kilometres, a number of riders sprinted away from the pack and the race was on. Five racers earned themselves a lead of five minutes or so: Van Goethem (Roompot), Peyskens (WB Veranclassic), Stosz (CCC), Cordeel (Veranda’s Willems) and Kuriyanov (Gazprom) steamed through Flemish and Walloon Brabant, while the troops of Quick-Step Floors kept everything nicely under control in the pack. At about the 80 km marker, the pleasant bicycle ride in the sunshine was over and done with and the real racing could start. Matthias Brändle (Trek-Segafredo) was the first to break away from the front of the pack, and a little later a group of nine racers, including Burghardt (Bora), Benoot and De Bie (Lotto-Soudal) and three racers from Roompot forged a lead at the head of the race. In the meantime, an unrecognisable Marcel Kittel had to give up on the Rue d’Ittre. The German later called it quits, as did Pippo Pozzato. With Bouhanni, another outsider had literally fallen by the wayside. At breakneck speed, the leaders and the pack overcame the hills in Brabant and pounded their way towards the finish line in the shadow of the King Baudouin stadium. However, the difference between the two groups remained fairly long at around 20 seconds, with the gap only being closed in the very last few kilometres. The Roompot crew displayed a magnificent team strategy, but it was Matthias Brändle who saw his chance, speeding away from the side of the pack. However, the Austrian’s lead was short-lived, ending a kilometre and a half from the finish line, with another classic sprint as a result. In that sprint, Arnaud Démare was clearly the strongest. The Frenchman made his way out in front, cleanly disposing of Kump and Greipel who had to come from way back and made no challenge for final victory. With Dehaes, Stuyven and De Buyst, three Belgians ended up in the top 6, but it was a Frenchman who stepped up to the winner’s podium to accept the bouquet with a broad smile on his face. So, after two respectable runner-up places over the last three years, it was finally bullseye for the blisteringly fast Arnaud Démare.